What is the Ankle Joint? The location where the talus bone in the foot meets with the bottom of the tibia and fibula is known as the ankle joint. The ankle is a complex joint. The ankle joint is found where the talus bone in the hindfoot meets the bottom of the tibia and fibula bones in the lower leg. Alternately known as the talocrural joint, it is categorized as a hinge joint, which is a type of synovial or movable joint that permits movement in a single plane. Specifically, the ankle joint is capable of hinging the ankle in a front-to-back motion, an action that is referred to as dorsiflexion and plantarflexion. 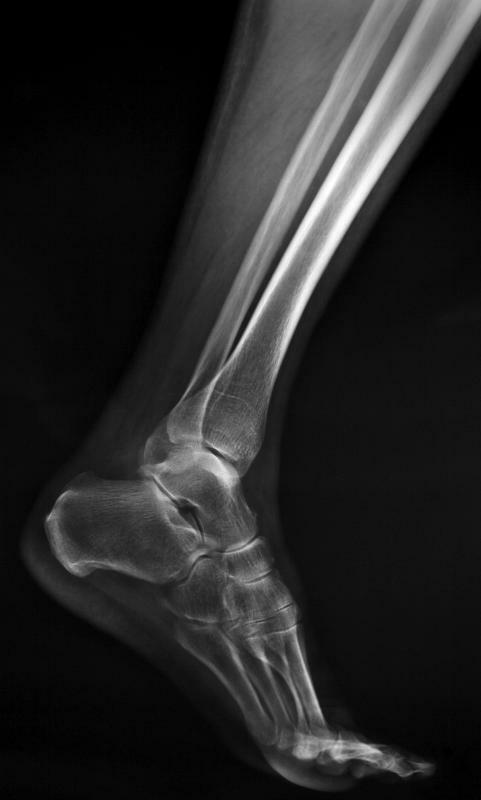 An irregularly shaped bone situated just above and slightly anterior to the calcaneus or heel bone, the talus transfers weight from the body across the ankle joint to the foot. Most of this weight is transferred via the tibia bone, and therefore much of the surface area of the superior or upper talus in the ankle joint is reserved for articulation with the tibia. This upper surface of the talus, which is convex in shape, is known as the trochlea tali, and it articulates with the inferior or bottom aspect of the lower end of the tibia. In addition to the articulation between the bottom of the tibia and the talus, the ankle joint consists of articulations between two other bony surfaces and the top of the talus, found to either side of the trochlea tali. The medial malleolus of the tibia, which is the rounded bony prominence at the lower or distal end of the tibia felt on the inside of the ankle, meets with a smaller and similarly convex articular facet found to the inside of the trochlea tali on the top of the talus bone. Likewise, the fibula makes contact with the talus, its lateral malleolus, the bony prominence at the lower end of the fibula bone that is felt on the outside of the ankle, articulating with a facet on the outer upper aspect of the talus. The whole of the articulation between the talus and the medial malleolus, inferior tibia, and lateral malleolus makes up the ankle joint. This joint is held together and stabilized with the help of several ligaments, including the deltoid ligament, anterior talofibular ligament, posterior talofibular ligament, and calcaneofibular ligament. Also known as the medial ligament of the talocrural joint, the deltoid ligament is named for its triangular shape and links the talus to the medial malleolus along the inside of the joint. The anterior and posterior talofibular ligaments traverse the joint on its outer or lateral side, connecting the lateral malleolus to the talus. Finally, the calcaneofibular ligament runs between the heel bone and the lateral malleolus, also along the lateral aspect of the joint. What Is the Posterior Malleolus? What Is the Calcaneofibular Ligament? What is a Talonavicular Joint? @ocelot60- It does sound like your friend has arthritis in her ankles, but this does not have to slow her down. Tell her she should consult with her doctor about the best way to manager her symptoms so she can get on with the things she enjoys. @ocelot60- Yes, ankles can develop arthritis just like any other joint in the body. The pain can be severe, but there are things that your friend can do to ease it so she can keep on doing the activities she enjoys. Keeping moving is a very important way to reduce arthritis pain in the ankle joint. Though anyone with this problem shouldn't do strenuous activities, stretching, walking, and using exercise equipment like a treadmill are great ways to keep the ankles mobile. Pain relievers that can be found over the counter are also good for relieving arthritis pain. Your friend should get approval from a doctor before taking them, though. A balanced diet rich in vitamins and minerals is also good for reducing arthritis pain, and for improving overall health. Finally, getting plenty of rest when she needs it will help your friend keep her ankles from being in too much pain. I'm trying to come up with some ideas to help a friend who is having ankle problems, but hasn't had a recent injury. Is is possible to get arthritis in your ankle joints? And if so, what are some good ways to reduce the pain and stiffness? I think of arthritis as a problem of your fingers, back, arms, and knees, but I'm assuming any joint can be prone to this disease.